Three all-natural products for your cutting board, cast iron pan, and hard-working hands. Every chef needs to take care of their tools, and this kit comes with the essentials. Each of the three products are crafted in small batches with all-natural ingredients, including: a coconut oil to prevent your cutting board from warping or cracking, a seasoning for your cast-iron pan that will maintain and improve its finish, and a solid lotion to moisturize hard-working hands. It's a set they'll want to keep handy every time they're in the kitchen (aka always). Handcrafted by Marit Aagard and Jeff Lovett in Pittsburgh, Pennsylvania. Every chef needs to take care of their tools, and this kit comes with the essentials. Each of the three products are crafted in small batches with all-natural ingredients, including: a coconut oil to prevent your cutting board from warping or cracking, a seasoning for your cast-iron pan that will maintain and improve its finish, and a solid lotion to moisturize hard-working hands. It’s a set they’ll want to keep handy every time they’re in the kitchen (aka always). 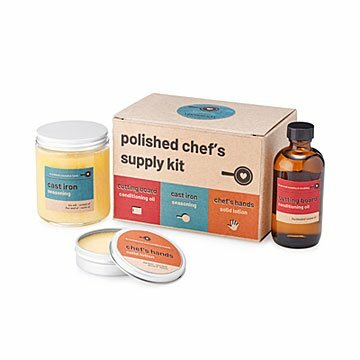 There's one place—and only one place—where you'll find the Polished Chef's Supply Kit: UncommonGoods.